Michelle Obama recently told the New York Times that her new memoir Becoming is “a rare moment in history that a black woman gets to tell her own story”, and while I was filled with apprehension waiting for her to come on stage at London’s South Bank Centre on Monday night, I was comforted by the knowledge that she would be in conversation with Chimamanda Ngozi Adichie. There was something about situating this particular conversation in the very capable hands of two black women, and therefore rooting the conversation in blackness, that told me it would be authentic, unapologetic, assertive and honest. Neither Michelle nor Chimamanda came to disappoint. Greeted by the elation of a mixture of 300 school children, press and some famous black British faces – Diane Abbott, Michaela Coel and Adwoa Aboah to name a few – Michelle naturally commanded the space in tandem with Chimamanda and exhibited grace and authenticity as well as a rawness that she has previously been unpermitted to do. Speaking on Michelle Obama and black women leadership at gal-dem’s pop up bookshop to commemorate the release of Becoming last week, I described leadership in our spaces as passing the tradition down, handing the baton over and refusing to replicate the same structures which have underestimated, limited and excluded us. I spoke of how the very fabric of our communities is built on interdependence and so black women leadership naturally looks a lot like personal sacrifice, legacy and safety. It became even more so apparent, however, just how deep that personal sacrifice and sense of legacy had impacted Michelle’s life and influenced her own leadership style after hearing her speak on Monday night. Michelle’s work has always been about “laying foundations”. She spoke poignantly about her working-class upbringing and the sacrifice she saw take place around her in order to allow her to succeed. Speaking candidly of her late father with a glimmer in her eye, Michelle described the “sense of injustice” she felt around his death and pondered whether she was making him proud as his legacy. She also spoke of how the constant affirmations she received in which she was told that “her voice was relative, her opinions meaningful and her anger and frustration real” had shaped her into the woman she is today. Describing her childhood as filled with “the sound of striving”, we were reminded of just how remarkable this woman’s personal work ethic has been and why she believes so passionately in unlocking the potential of those who are barred from accessing what they are capable of. This belief permeates across her various campaigns, but is no more clear than in her passion for girls education; Michelle stands by her assertion that to value a girl is to keep “that flame lit” from childhood and not to extinguish it. In recent years, black women leadership has almost always meant being the first to navigate spaces. That, in turn, has often meant hypervisibility and public dissection as you open up spaces for the black women who will succeed you. For a woman who was undoubtedly one of the firsts, it was important for all the black women in that room to hear that they do not need to douse, contort or shrink themselves in order to be black women leaders. For the young black girls in the room, including myself, it was both enriching and affirming to see one of my sheroes detail how much work they had put in to make spaces more accessible or at least seem more attainable to the future generations; Michelle herself had been on the frontline. Despite her ability to infuse each of us with strength, Michelle was also unashamedly vulnerable and incredibly honest about her frustrations and self-doubt. During a moving short film about Michelle’s life before she took to the stage, she describes herself as “female, black and strong, which translated to angry” and mentions growing weary with the detachment she felt from “a woman [she] kept hearing about but didn’t know”. Hearing Michelle reference the all too familiar experiences of misogynoir sparked a series of whoops and rounds of applause, no doubt from the black women that made it into the event. I was unsurprised but saddened by the confirmation that black women are policed at every point of society. While black women laughed along, shed tears and applauded auntie Michelle and Chimamanda, both parties had been tentative in addressing black women specifically until, noticing the importance of such dialogue, Chimamanda, who corrected herself when saying women of colour, asked what her “message for young black women” was. 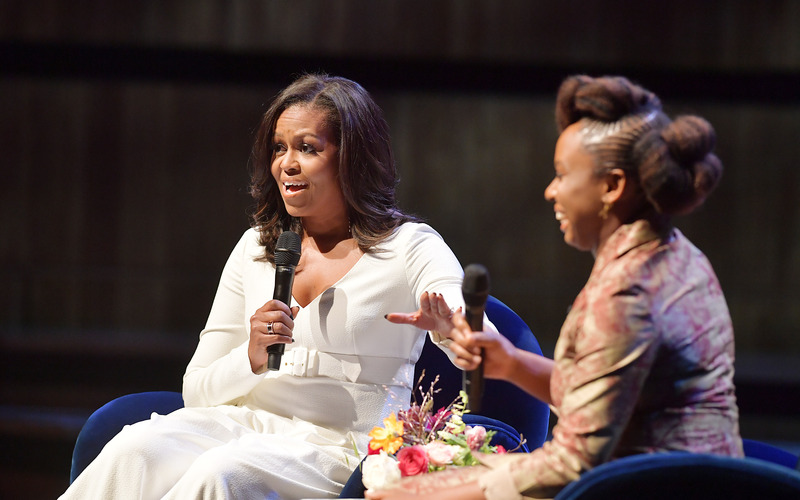 Michelle’s confession that “Chapter 17 was the hardest chapter to write and go over” because of the caricatures black women face, was a nod to every black woman in the room (and a nudge at Melania Trump who plagiarised one of Obama’s speeches) and made the notion of sacrifice in black women leadership very real. “People will literally take our voices… the size of our hips, our style, our swag”, she said, adding that “black women are co-opted, demonised, we’re too loud, we’re too everything”. As Chimamanda acknowledged, “the stakes are so much higher” because she was the first black first lady. However, when they go low, Michelle goes higher and that is why her most poignant piece of advice for me, was the idea that we must “start by getting those demons out of our heads” and unlearn “the messages that are sent from the time we are little: maybe you are not [good enough], don’t reach too high, don’t talk too loud”, because there is no better way for the people in power to keep that monopoly than to tell us we don’t belong. By constantly holding each other and dispelling these myths amongst the coming generations of black girls, we are continuing a legacy of black women leadership in order to make a change. Michelle herself states that “change is not a straight line”, and so in that journey towards owning our blackness, there is also a parallel journey of political progression too. Both are slow processes, but in the same way that Michelle believes it was a mistake to think Barack could erase hundreds of years of slavery and injustice in eight years, is the same way that shifting the culture towards black women will also be difficult. “You don’t make sacrifices with idea that you’ll see the fruits of that… You do it for your grandchildren – that’s how we make progress”. The fact I’m writing this article is thanks to the black womxn who came before me – the brave black faces I saw on screen, the ahead-of-their-time activists I still religiously follow on Twitter, and the community leaders I hope to emulate one day. It’s because of them that the future feels less like trying to justify and insert ourselves into Eurocentric spaces. There are footsteps to follow in, fierce ones. And while we must continue to challenge and disrupt the mainstream, we are finally reaching the point where, dare I say it, we no longer need to look to it to measure our value or success. Black women have created their own safe spaces. Spaces where our blackness can be unapologetic and unregulated, and not be the defining facet of our identity. As unlikely as it sounds, for one night, the Southbank Centre became one of those spaces. I felt embraced by every “period”, every “amen” and every pause she took to fight back tears and so to the black women present, we weren’t just an audience, we were a community. We weren’t just attending, we were healing. And we weren’t just listening, we were learning. Spaces like that feel like a long-craved embrace and the permanent sign that we too have claim to this world. They remind me of words like intersectionality and misogynoir which filled the linguistic gaps that failed to articulate our experiences or alternative media and spaces like gal-dem, Black Ballad and Black Girl Fest. Spaces which give us access to our faces, our voices and our histories. This is the glimmer of hope and of the future that I saw every time Michelle spoke of legacy, of young people and f the future: having agency and control over our own narratives, lives and existences. “If we plant the seeds they’ll grow” – and this is why black women leadership for Michelle is Becoming. Constantly reaching “towards a better self” and shifting the culture because growing is not a finite process and Michelle says she is nowhere near here.